Synthetic grass installations have significantly grown in popularity over the years, and consumers now have plenty of turf installers to choose from. The demand for artificial grass has been so high that even hardscape contractors are getting in on the action, adding artificial grass to their list of specialties to accommodate their clients. 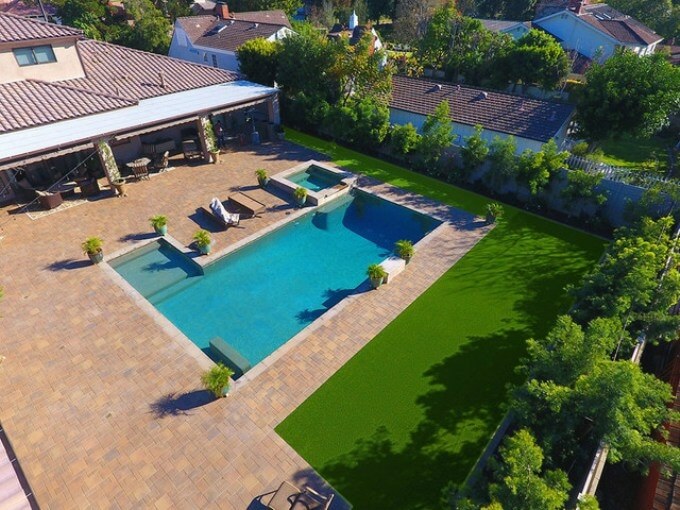 Hillside Pavers, based out of Orange County, realized that adding artificial grass added an entirely new dimension to their landscaping projects. Owner Oscar Valente knew that artificial grass was a perfect match for their masonry services. "It really sets us apart and from other landscapers in the area, especially in the eyes of the homeowner," Valente said. "We offer a multitude of services and we found that it really helps with the customer experience from beginning to end." Valente recently installed 1,575 sq. ft. of TigerTurf Pet Turf, a product sold exclusively through Synthetic Grass Warehouse. "They originally hired us to install new pavers surrounding the pool area," Valente said. "Once we were finished, the homeowners mentioned they did not like the way their existing turf looked against the new pavers." The homeowners had artificial grass previously installed but were unhappy with the product. "The old turf didn't have proper drainage so everything would trickle down into the pool," he said. "We decided to re-level the entire area before installing new synthetic grass for them." He said this is a perfect example of who his clientele are. "They're always letting me know how much of a convenience this is for them - and they're more comfortable going through one company to meet all of their needs instead of having several come in and out of their homes." Valente believes that one company allows for better communication. "We explain each step - they almost feel like they are part of the installation," he said. "We listen to them, help come up with a solution, then stick to it -- there are no surprises here." Valente has been in the business for over 15 years before founding Hillside Pavers in 2015. He said that all of his installers are ICPI (Interlocking Concrete Pavement Institute) certified -- their employees have received training on the latest standards and best practices related to the installation of interlocking concrete pavements. "Not many can say that they are earning a living off of their passions, but I can," he said. "We aren't doing this just for profit, the relationships we establish with all homeowners are invaluable."